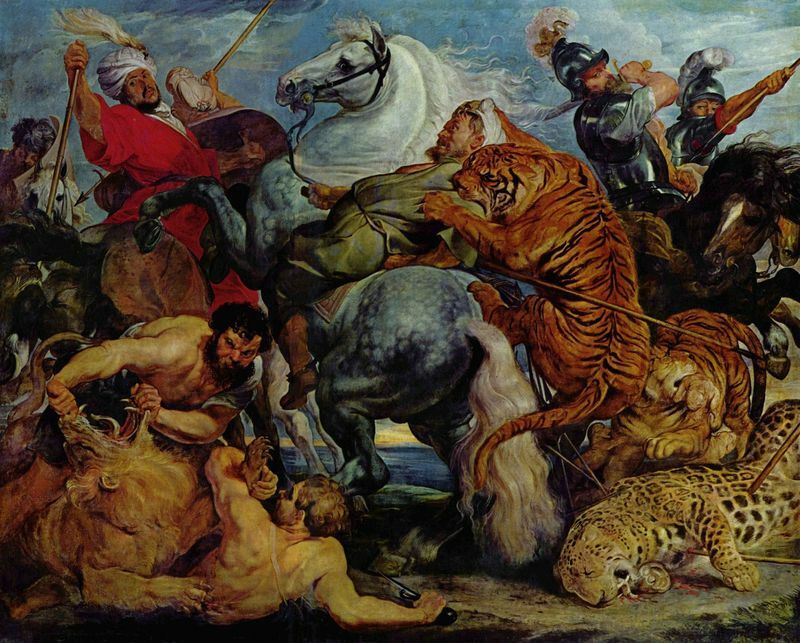 Rubens was commissioned by many of his wealthy connections to depict the wild and exotic creatures they hunted and owned as they conquered lands and colonies in Africa and the East. Hunting animals was still illegal to most people in the 17th century and was reserved for wealthy royal subjects. Aristocrats such as the Archduke of Brussels had a zoo full of animals and Rubens would often go there to sketch and observe these wild beasts. As Europe was still discovering these different lands, many people had not seen such creatures and Rubens would entice the viewer's imagination through wild and dramatic scenes. His depictions were popular amongst wealthy patrons and the general public as he portrayed these animals in all their natural glory against the intellect and tact of man. Such images were also a sign of status as wealthy patrons could show that they had the money and power to hunt and own these animals. Rubens aimed to evoke emotion with his images and he often painted the human body as tortured, exhausted or contorted as the beasts would ravage it. 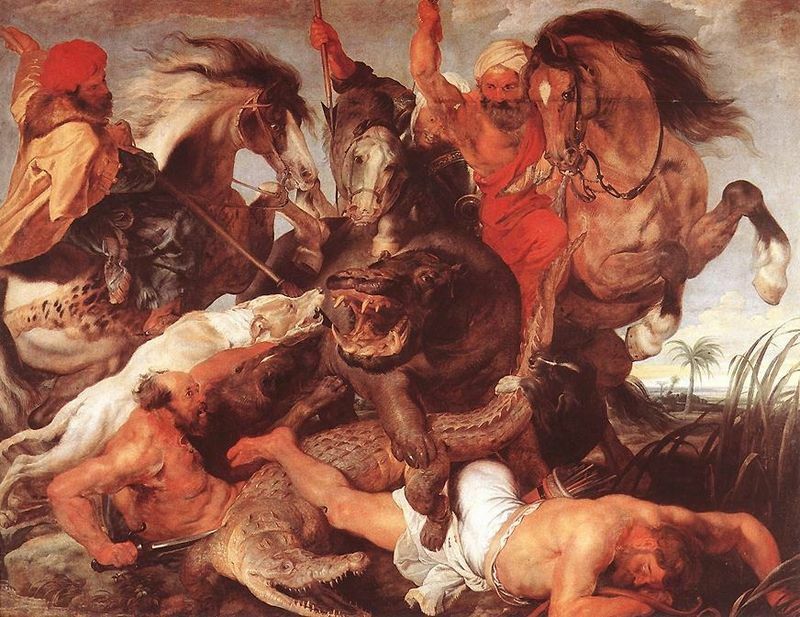 Different animals were depicted as well as different ethnic groups as Rubens enjoyed painting people from all over the world for aesthetic purposes and to depict the moment of the hunt as it had actually taken place. Lion Hunt was commissioned by Maximillian I, Duke of Bavaria. The image is one of hunters on horseback attempting to fight off a lion who threatens the life of the man in his grip. Another man kills a lion and his corpse can be seen lying beneath the horses. There is no literary source for this violent study, but there are a number of visual precedents, notably by Leonardo da Vinci. Rubens' depictions of wild and exotic animals were much in demand and to create them he would draw inspiration from stories of his wealthy patron's adventures in far off lands. David Rosand says: "In this, as in all his work, he drew upon the traditions of classical art, ancient and Renaissance, enriching it with a new vitality derived from his Flemish heritage." In this work there is a slanted, horizontal plane. The lion biting the hunter in the foreground is the focus and the knight coming from the back of the image creates depth as well as a three-dimensional space. 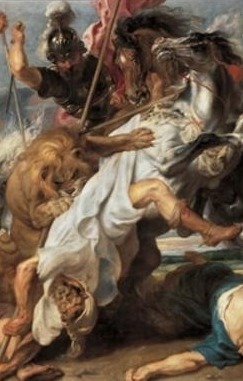 The Arab hunter with the shield has his horse facing the opposite direction which also gives the illusion of depth and Rubens succeeds in establishing correct proportions for each character. There is a circular viewing process in this work. First we see the falling hunter whose contorted body blends in with his flailing horse. The horse's head adjoins the knight's horse which leads the eye to the knight. The knight's lifted arm directs us to the hunter boldly painted in red and then the gaze is directed to the hunter on the ground with a lion on top of him. He points his dagger, ready to stab the lion that is about to fall on him. From there the eye is drawn back up to the hunter in white. The hunter's foot also points out the fallen hunter in blue and the darkened horseman to the right. In turn the darkened horseman hoists a rope which pulls the viewer back into the main scene. Rubens creates a very dark background so that the central figures are easy to distinguish amidst the chaos. Bold dashes of his signature red can be seen in the Arab's cloak and darker hues for the cloak worn by the knight. The knight's cloak has various tones of red combined with deep shadows to create movement in the fabric. For his lions, Rubens uses strong yellows and browns for definition, muscle contortions and stress. Detail and smooth, swift brush strokes are used for the lion's mane to accentuate its sensual and exotic texture. This also shows the looseness and movement of the mane as the lion grapples his attacker and shakes him with strong head movements. Strong lines of grays and blues are used for the foreign skies under which the event is taking place, with strong dark greens and yellows for the dusty earth. The viewer cannot fail to notice the tortured hunter in sheer white as his body is ripped from his horse by the lion. "In animal painting, Rubens stands at the crossroads of timr as the greatest mater; there is one kind before him and another after him." "Surely no artist before him had so successfully integrated wild beasts into the formal and expressive vocabulary of dramatic painting. Before, Rubens, only Leonardo had articulated the problem; after him, only Delacroix attempted to deal with the theme on a comparable level. 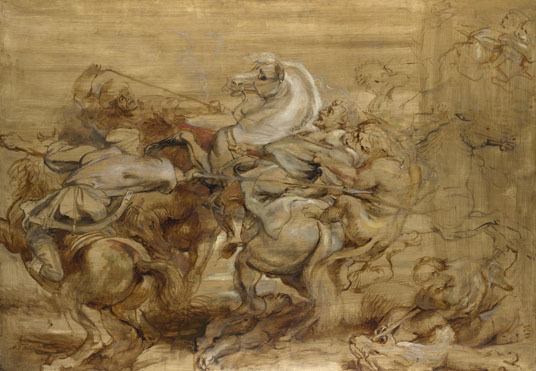 What Leonardo had envisioned for the horse in battle depictions - namely, full dramatic involvement, equal to that of the human form - Rubens extended to the hunting scene. In this, as in all his work, he drew upon the traditions of classical art, ancient and Renaissance, enriching it with a new vitality derived from his Flemish heritage... His final rendition of this theme, the Lion Hunt in the Alte Pinakothek in Munich represents not only the most brilliant pictorial solution, the most affective narrative exposition of the dramatic action, but also the fullest expression of ideas and ideals that had become fundamental to the them itself." There are several other works of this kind by Rubens. 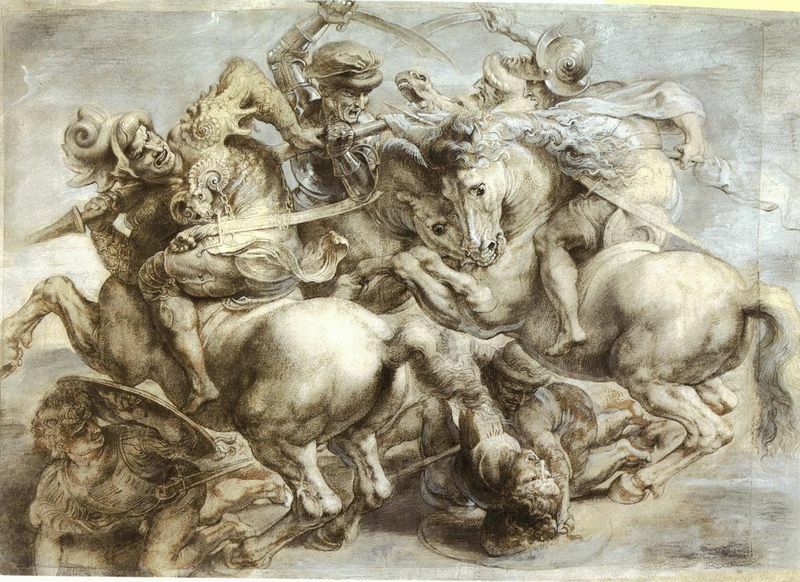 It seems that Rubens' drew inspiration from Leonardo's fresco of The Battle of Anghiari and he created a drawn version. Rubens' hunting works were important paintings in his oeuvre between 1615 and 1621. He aimed for realistic depictions and strived to evoke emotion with his images and often painted the human body as tortured by wild beasts. 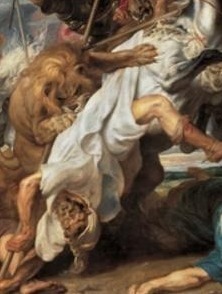 Rubens had a fine eye for detail in creating a sumptuous realism in his paintings to express the human condition of agony and sorrow, as seen in Lion Hunt. Inspired by the great masters of Italy, Rubens was a prolific artist who developed a style that would make him a great master in his own right. He completed many commissioned works across Europe and his hunt scenes were regarded as symbols of wealth and status. Rubens approached art with a passion that had not been encountered for centuries. He loved portraying the human being's emotional and psychological state through the depiction of the body and being an avid humanist, he sought to paint realistic works. 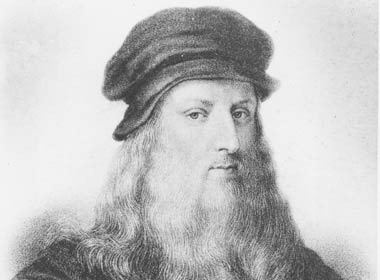 The Baroque style originated in Italy and its pioneers include great artists such as Michelangelo and Tintoretto. Baroque art centered on impersonal and generic works with an animated and energetic mood. This art genre came into play at a time when the foundations of capitalism were being laid by the world's growing economies and art was expanding in new and exciting directions. The success of the Baroque style was promoted by the Roman Catholic Church, which had decided in response to the Protestant Reformation that art should focus on religious themes and emotional involvement. The aristocracy also saw Baroque art as a means of demonstrating wealth and power. One of the greatest examples of what Baroque means is conveyed in a series of paintings by Rubens created for Marie de Medici at the Luxembourg Palace in Paris. Flemish Baroque painting developed out of the Southern Netherlands between about 1585 and 1700. 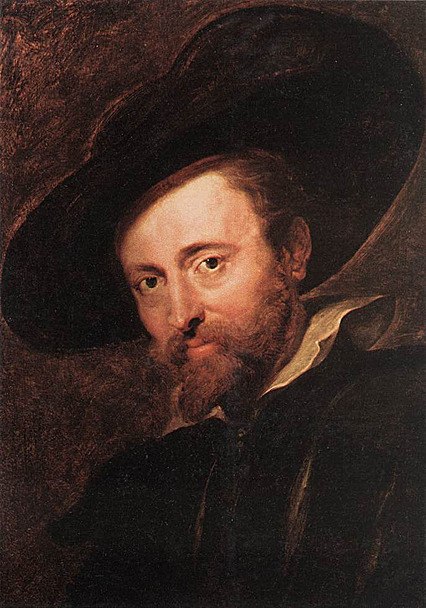 Rubens played an instrumental role seventeenth-century visual culture and his works helped put Antwerp on the map as one of Europe's major artistic cities, particularly with regards to Counter-Reformation imagery. Flemish Baroque painting saw emphasis shift to still-life, genre paintings of everyday scenes and landscape painting. However, many artists such as Rubens preserved traditional religious subject matter. Rubens is known for helping to develop the Baroque altarpiece. To find out more about Rubens and his works please refer to the recommended reading list below.